Welcome back to Dancervival! This 5 part series is aimed at helping dancers with mental illnesses and cognitive differences live well, cope well, and achieve their dance dreams. Check out the introduction here, and Part I here! From the time we’re just little ballet nuggets we get ballet terminology thrown at us pretty regularly. By age 12 or so, we can spit out the definitions of most of ballet’s basic terms. I don’t know about you, but I greatly prefer degages over tendus. Something about the action of lifting your foot from the floor for the first time in class - it’s kind of magical, every time! You’re warm enough to use your hamstring to take your foot off the ground. That’s why degage, or disengage, has a specific meaning in our Dancervival journey - it means we get to DISENGAGE from what society says about your illness. We disengage from fear and stigma that others have towards us, and we disengage from the ableist practices the world can throw at us. We also start to disengage from the harmful and debilitating symptoms of our illness - we start to take small but concrete steps towards freedom by being active and vocal about what we’re going through. On a day to day, moment-by-moment basis, we'll be using tangible coping mechanisms to keep us balanced in our daily life. Others might disagree, but I’m a big proponent of disclosing what you’re going through to teachers and friends you trust. You can decide how much or how little to tell them - it can be as simple and vague as “I’m having a hard time right now” or as complex and comprehensive as informing them of your diagnosis. Don’t go announcing it to casting directors or company directors (although there shouldn’t be a stigma around doing that, in my opinion, but whatever), but do make a list of people who you feel should know and would be supportive of what you’re going through. Schedule time to talk to them. Before I went public with my illness, I shared it with my program director, my faculty advisor, some trusted mentors and some close friends. By this time I’d been suffering in silence for more than a decade. Wesleigh and Miranda were some of the first people I shared with without having known them very long at all. They both remain good friends to me. That little speech got me a hug every time. Really. Jokes aside, 9.5 times out of 10 the person you’re speaking to will want to help you, and offer whatever support they’re able to, whether it be medical or financial assistance, access to therapy, help telling your family, or just a hug and a daily check in - get you some true friends who care about you. If and when they express willingness to be supportive and encouraging, don’t be afraid to let them know what you need. Whether that’s daily check-ins or a quick “you good?” before class, establish that early on so that you can both become adjusted. 2. Keep a Go Bag Packed. If you’re like me and still on the audition circuit, the entire task of getting out the door to go to class or auditions can feel very overwhelming. For someone with Executive Dysfunction, a cognitive impairment often present in folks with ADHD and Autism Spectrum Disorder, the minutiae of packing a bag and getting out of the house on time can be paralyzing, scary and panic-inducing. This fear can be exacerbated if it’s been awhile since you’ve been able to muster the energy to go. Something that I struggled with when I was first getting back into audition shape in 2015 was the constant packing and repacking of my dance bag, making sure I had all the necessary items, going back and forth making sure I didn’t forget things...that just added to the already staggering anxiety of leaving the house in the first place. So, I got a new dance bag (part of my problem was that I was consistently having to carry more than one bag because my old dance bag was so small) and threw everything I needed regularly in there. Warm up jacket, small rollers for my feet and lower back, headshots, a pen, notebook, pointe shoes, flat shoes, LaDucas...all I had to change out every day was the leotard and tights, which I would almost always do the night before. That way, even if I was running late in the morning, all I needed to do was throw some clothes on and do my hair. 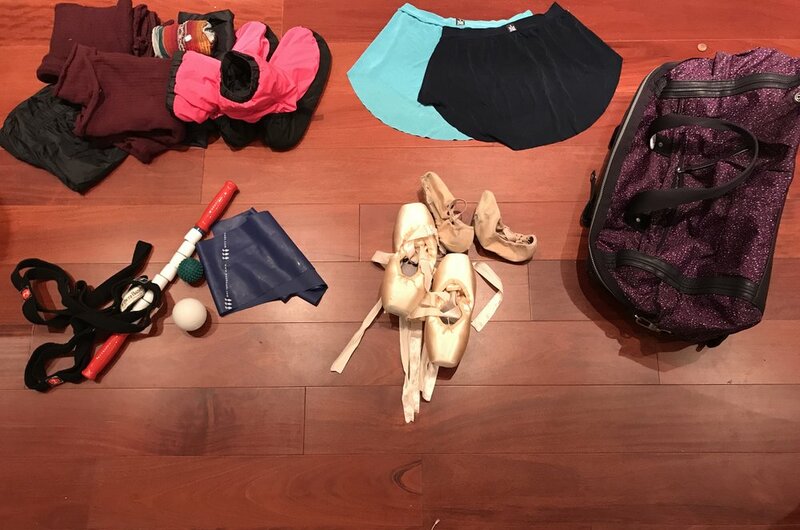 I’ve talked about what I keep in my dance bag HERE, so you can get an idea of what you might want or need. If possible, keep your schedule handy as far in advance as possible. If you’re in a company where you don’t get your schedule until 48-72 hours in advance, take a photo of the schedule as soon as it goes up. If you’re taking open classes, check and see if your studio has an app. Both Steps on Broadway and Broadway Dance Center here in NYC have mobile apps available in which you can see who’s teaching when, be kept abreast of any last minute changes, and in some cases, register for the class before getting there, which can save you about 5 minutes depending on the class or the time of day. As we all know very well, mental illness doesn’t take days off, but neither do you. This creates a need to manage symptoms and often unpredictable emotions on a minute-by-minute basis to the best of your ability, self-checking and self-regulating at what can feel like a breakneck speed. Warm Ups Are Key: I tend to get angry at myself during class when my leg doesn’t go as high as I know it can, or when my turnout is weaker than usual. For folks with anxiety and depression, that momentary frustration can spiral into a tirade of negative self talk and shame, often happening silently at the barre while you go through the motions. We want to be present and energized in every moment, but that is incredibly difficult when you live with a mental illness, so key here is heading it off with a solid warm up - take as much time as you need and use your time wisely. I am the QUEEN of getting distracted during warmups, especially if my friends are at the same barre. If the squad’s there and the conversation is too lit, I will abandon my workout entirely just to hang with the girls. But what’s best for me involves warming up my mind and body for class, and that has to take priority. The squad will understand. Feel a panic attack coming on during class? Take a break: Unfortunately, symptoms don’t take breaks, and can strike at inconvenient times. I know the awful feeling of feeling your anxiety and panic spike in the middle of class, or for your depressive mood to worsen right before a performance. My go to recipe for surviving near panic attacks during class is to head for the back corner and just do some releves, balance in passe, take some deep breaths, and really just take myself out of the class for a second - there’s a meditative rhythm to releves, and there’s a quiet to be found in balancing in passe. By using your technique to minimize your anxiety levels, you’re doing yourself a twofold favor: you’re engaging the muscles you need to keep dancing, as well as the muscle you need to actively combat the symptoms of mental illness. Once class starts, I’m in the zone. Like most folks, I really try to focus in class because I know that’s where the real work happens - where technique is improved, corrections are taken, and strength is developed. 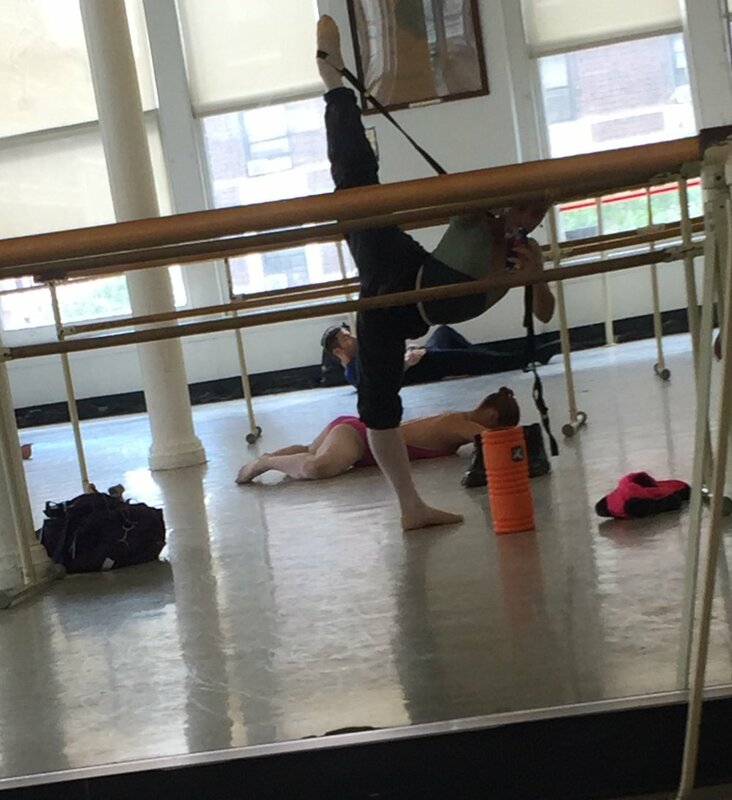 We all set goals for class, whether we know it or not - “I’m gonna do 4 pirouettes next time”, or “I’m going to stand in the front so that the director notices me”, or even “I’m just gonna do my best and see what happens”. But like we said in Part I, big goals can feel overwhelming and can be difficult for those of us with Anxiety, ADHD or Autism Spectrum Disorder. Big goals can trigger the self doubt that also comes with Major Depressive Disorder, and can lead to more negative self talk. Negative self talk is one of the hardest components of Anxiety and Depressive disorders to overcome. Now, I am not and never have been a “positive self talk” person, because it feels fake to me. You can all save whatever “positivity” lecture you were about to give me, because I truly do not care. Fact of the matter is, I have a routine works for me - one that feels less fake and is far more motivating. I will maintain my turnout in second position. I will square my ribs when I tendu to the back. I will not pronate on my standing foot. I will decide whether I want to do it on one side or both. 1) Very simply, it improves technique. I’ve been building my technique for years and, whether I recognize it on any given day or not, am capable of challenging myself in a way that I was not capable of doing so when I was 8, 14, or even 20! 2) It gives me something specific and self contained to focus on. If I’m concentrating on improving something small within myself instead of comparing myself to the other dancers around me, (which is a huge issue for me), I’m more likely to maintain a balanced mindset and avoid negative comparisons. 3) It forces me to make a decision very quickly, a skill that those of us with anxiety and/or Asperger’s often don’t get a chance to develop. Since I often have to decide what I’ll do with the combination while I’m watching it, I don’t have time to doubt myself or change my mind. When I achieve those goals, I see them as small puzzle pieces contributing to an overall improvement - improvement of my technique and improvement of my cognitive and emotional wellbeing. Some days, it just doesn’t happen. Morning panic attacks, depressive episodes, oversleeping after anxiety attacks, take your pick - sometimes it just doesn’t work out for you to get out of the house to class in the morning. Mental illness is unpredictable, inconvenient and weakening. I used to get so angry at myself - I felt so guilty for not “chasing my dream” (more on why this is in air quotes later) with the veracity that I felt was appropriate. I would beat myself up all day, mope around, and let my depression and low self-worth get the best of me. One day when this happened, I was feeling particularly tight, so I hopped on my yoga mat and did some stretching. I felt less upset afterwards, and realized that what I really needed was to feel that I’d moved my body, gotten a bit of a workout, and improved my technique even a little. I even gave myself a short barre in the kitchen! Realizing that there would likely be more days like that one, I invested in some at basic at-home fitness gear: small weights for my wrists and ankles, stretch bands, foam rollers, and eventually a bosu ball. On the days when I’m just not able to get out, my anxiety is alleviated by knowing that I have the tools I need at home to stretch and strengthen, even if I didn’t make it to class that day. Plus, I find that most kitchen counters (my own included!) are just about barre height! Of course, nothing can really replace a good technique class, but like so many other aspects of life with mental illness, you make do with what you have and work towards the rest. Invest in whatever is in your budget allows - small (3-5lbs) weights are good for light strength training, and weights that can attach to your wrists and ankles are even more useful! A good yoga mat will be useful in any situation. If the gym scares you, try cardio or yoga workouts on YouTube. Having a backup plan (and these few, but useful items) will help to ease your anxiety on days when panic attacks or continuous depressive episodes prevent you from adhering to your original plans. Equip yourself with the ability to train even when you have trouble getting out of the house. This may feel like a lot to attempt at once, but rest assured that you needn’t: you can pick and choose what you need from these steps and modify them to suit your immediate requirements. This stage is all about actionable items - things you can do right now to make progression towards your dreams while also maintaining your mental health. In the next stage, we’ll talk more about how to kick it up a notch, not only in your personal efforts toward wellness, but in your professional interactions with people who may not understand you.